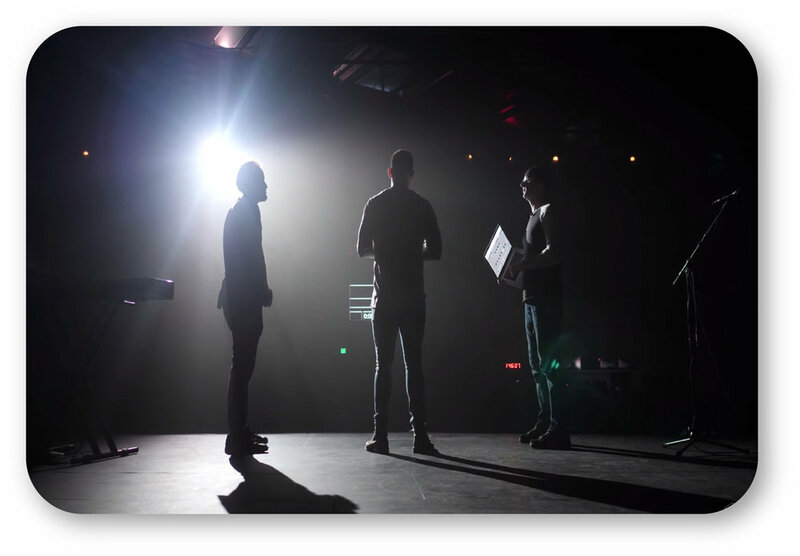 Mark Wray is the technical producer at the Lakewood campus of Red Rock church in Colorado, and I chatted with him about how to dial in the lighting design of your church. I learned a TON from his expertise and I’m stoked to share it with you. We chatted about some quick tips on how to light strategically and the best practices for churches that won’t break the budget. We’re going to cover three different aspects of lighting in this article. Mark began as a volunteer on the audio team when Red Rock was founded in 2005. At the time, they only had a couple dozen people attending, and Mark said the early days were pretty tough when it came to production. Now they’ve seen some massive growth and have 14,000-15,000 attendees each weekend. Which as also caused his role to change quite a bit. He’s done a lot of work to help get Red Rock to where it is today and he took the time to share his techniques for creating quality lighting design. Lighting can look pretty complicated, but I’ve simplified things so we’ll only cover one principle at a time and build out from there. To start out, light your speaker from the house right side. Put a light off to the left side up there so that it’s shooting the left side of the speaker’s body. As you can see, the light is going from head to toe, there's no dark spots, it's a pretty flat light all the way through. So what you want to do now is illuminate him from the right. Now, both the left and right side are equally lit, but you’ll need a third light so the speaker doesn’t look flat. With only two front lights, the speaker looks pretty one dimensional. To round him out and add dimension to his head and shoulders, use a back light to round out his body some more. With the backlights on, there’s more warmth and glow on his shoulders and head. When we’re looking at him from the audience, he looks more three dimensional. So that's how you light a speaker. Just have some great front lighting, the two lights up top and have one or two back lights and there you go! Since I’m a worship leader, I volunteered to step in and let Mark light me. Lighting a worship leader is a little bit different. Mark doesn’t use any of the same lights to light the speaker and he only dedicates one light for each individual worship position whether they’re upstage or downstage. Any more than one light can turn into overkill and take up too much attention. Mark used one ellipsoidal coming in from the house right side and it wasn’t directly shining on me. Putting it a bit off to the side brings in some shadows and adds depth because if the lights were straight on, I would would look flat; with the light coming in from the side, you’ll see more shadows. Mark will also add a color wash to change the mood and evoke different feelings for the audience. Pro-tip: It’s important to not didn’t have any of those color washes on the front tress, they stay in the back lighting and side lighting. The front lighting comes from the ellipsoidal lights and lights that have more of a natural tungsten look. Most of the LED lights here on the Red Rock stage are used as back/side lighting. These two designs are good for the beginning of service. Both the spot fixtures and are desaturated and are in their home position. Mark uses spot fixtures with wheels in them, and these are the colors he has to work with. Faster songs usually require brighter lights. Slower songs, on the other hand, require darker lights. However, sometimes it could be a good idea to use a saturated amber color and white to create a look that people aren’t used to seeing. Don’t use something like a red and blue. It’s a look you don’t see and it can distract people. Definitely not for a Sunday or worship song. Don’t combine yellow and green. It just doesn’t look attractive at all, although it may be useful for a youth event or special concert. 5. Your lights don’t need to move. Your lights may move, but you don’t always need to move your lights. Creating an intentional, stationary look goes a long way and helps people focus. For Mark, haze is an integral part of a worship service because it helps fill in the spaces and make the scene more full. Without haze interacting with the light, it wouldn’t feel complete and people wouldn’t be able to see the nuances and subtle movement of the light beams. These are some of the best practices and essentials of lighting design for a church worship context from one of the best light designers out there. I know I've taken away a ton of great ideas I'm going to apply to my church ministry context and I know other folks who've watched this video will be able to do the same. And before you go, I wanted to let you know about a free gift I have for you, it’s my worship toolkit which you can find here. It’s my complete list of all the gear and software I use in my worship ministry. I'm at a small church plant and I know sometimes it can be tough finding all the right resources for ministry so that's why I've compiled this all together into one list called My Worship Toolkit. So hit the link, complete the form and I'll send you instant access to that toolkit. Make sure you don't forget to subscribe to my Youtube channel and hit that notification bell so you can receive all of our latest content to help you grow yourself and grow your church!